I’m not quite ready to give it up yet… the sweet summer days. When my boys play barefoot in the grass, get dirty, and all it takes is a romp through the sprinkler to get them cleaned up again. No, not quite ready yet… but I know I have to make that shift. 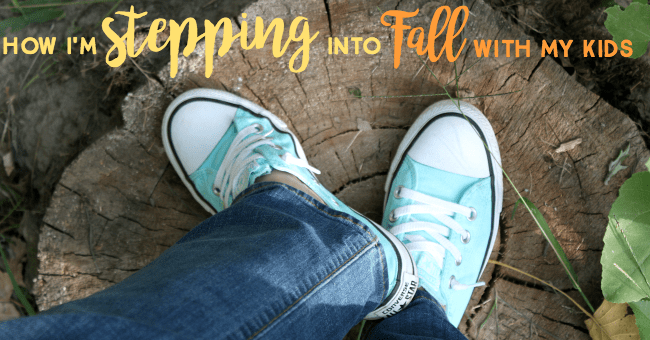 Here’s how I step from summer into fall with my kids. Routine is good for me. Summer, with all it’s “free-ness” is actually hectic, with slapped together grilled dinners and salads and a sense of “what shall we do next?”. But fall brings routine and stability to our lives. Regular grocery trips replace farm-stand wanderings, and the boys love running ahead to grab a cart, or helping pick out snacks for bagged lunches to bring to co-op. I plan crock pot meals and freezer meals for the school year schedule, bake pies, and relish in the bounty of fall harvest. Know what else I like to make routine? A similar type of “uniform” to wear daily so I don’t stress about clothes. Skirt or sweats topped by tank and tee combo! Grabbing the same pair of shoes eliminates one decision from my day – and the pop of color means I’m never boring! More time to power through the season’s daily chores! The days are steady, dependable, and full of a quiet busyness.We shop for school clothes, and even I gets a new pair of shoes at Famous Footwear. I think it’s good to start the school year with something fresh and new for moms too! I pick out Women’s Chuck Taylor All Star Shoreline Slip On in a color that will remind me of summer: pool blue! With these fun kicks, I’m actually excited to enter the fall seasons when it’ll be cool enough to wear these shoes! In New England, we’re blessed with ever-changing seasons. What’s awesome is how the seasons are distinct in character, yet somewhat fuzzy in their comings and goings. One late summer day, we had a chilly morning… but ended up at the pool after lunch with eighty degree heat! I remind myself that the journey into fall is a series of lovely steps, not an abrupt plunge. So we visit our favorite summer haunts: the pool, the shoreline, the Aquarium, splash pads, even in September! Bonus: this time of year the pools and playgrounds are nearly empty, so I can truly put my feet up and just watch my kids play without the stress of having to be an eagle eye mom! We cash in our favorite summer memories for some final moments in the sunshine. The rumble of school buses by our house sends another notice of seasons changing. Even though we homeschool, the back to school season can still bring a busload of emotions! The familiar yellow bus makes my heart twist with nostalgia, a sense of something ending… but there’s also the excitement of a new beginning! We, too, pull out our favorite books, and snuggle onto the couch for a read. It’s comforting to know we’ll fall into a routine of morning reading on the couch, wrapped in blankets with coffee and cocoa handy! Later, we’ll go for a walk and see who can be the first to spot a changing leaf, or collect an acorn. Do I miss flip-flops? Sure, but pulling on this pair of brightly colored Converse sneakers brings a sense of fun to these fall days. My shoes even conjure up memories from my own childhood, when I sported black and purple Converse high tops! Our walks can be longer and slower, without the summer heat dragging us down. I love to say, “Summer isn’t over until September 21!” even as the mornings grow crisper and cooler. Letting go of summer is as hard as letting go of my boys’ and their ever-changing childhood. Funny how the other seasons don’t affect me as much as this step from summer into fall. But grabbing hold of familiar fall routines steady me. As a mom, I’m the one paying attention to the schedules and shifting seasons… but my kids are just living in the moment. So I’ll jump into my Converse shoes and into a pile of leaves with my kids! Having a comfortable pair of casual shoes helps me get into the moment with them! Plus, their no-fuss slip-on style helps me get ready to run out the door quickly to keep up with my boys. This step from summer into fall just means a host of new memories about to be made! Do you have a pair of shoes that brings back memories for you? Share your top shoe picks from Famous Footwear either in the comments here or on Twitter and Instagram! How do shoes help you power through the busy seasons of life? This post was sponsored by Famous Footwear, and I received a gift card as compensation. All opinions are my own. ok I love the color of those shoes!! !